A luxurious authentic Louis Vuitton white gold heart locket pendant, with finely etched borders and the iconic LV symbol. 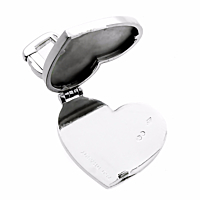 This Louis Vuitton locket heart pendant will keep a small portrait of a loved one safe for you inside. A brilliant Louis Vuitton gold heart pendant, for yourself or for a special someone.